Sacred music began tumbling from heaven to earth in the late 16th century, when the words it was sung to became something more than liturgical reference points. It took on more qualities of human speech and a greater intensity of meaning. The turn of that century was the essential tipping point from the rules-based music of the Renaissance to the more emotion-based music of the early Baroque. Though Tomás Luis de Victoria (1548-1611) lived and worked right through that tipping point, his music always seemed to me distanced from it – until I heard Stile Antico sing his Tenebrae Responsories on April 8. 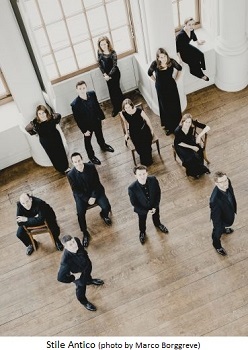 The England-based group – presented every other year by New York’s Music Before 1800 series – has never fallen into line with the British choral tradition, eschewing the ceaselessly ethereal blend of The Tallis Scholars that makes everything sound like Palestrina. No, Stile Antico goes for something with less radiance, more contour, and a more specific realization of the composer’s personality and the character of the piece itself. In its early years, Stile Antico was criticized for sounding feral (relative to other Renaissance music groups) – no polyphonic Advil for them. But in these Victoria pieces for Holy Week – as heard both on a new Harmonia Mundi disc and, especially, at Corpus Christi Church on that Sunday – Stile Antico sounds almost angry, and with reasons to be found in the very heart of the music. Whether or not such an approach is historically responsible can be debated by scholars for generations. We know that composers such as Carlo Gesualdo (1566-1613) were exploring more personal means of expression at that time. And he was hardly alone in doing so: look, for instance, at the less-tortured but just-as-adventurous Sigismondo d’India (1582-1629). Even if you weren’t consciously thinking about the historical justification for their emotive delivery, Stile Antico’s arresting readings never felt imposed upon Victoria’s writing. Often, I couldn’t help feeling that these singers had unleashed rhetorical power that was always there, albeit under the surface. In his notes for the great DG Archiv box set of Victoria’s sacred works by Ensemble Plus Ultra, director Michael Noone wrote that the composer’s art “is defined by its polished surface, its understatement and its intense sensitivity to the possibilities of the human voice.” I don’t exactly disagree with that now, but I would say it’s hardly the whole story. (And not just for the Tenebrae Responsories, as spot-checks in that box set show.) By no means have the inner tension and charged emotion in Victoria’s music been ignored by past performers – they just haven’t gotten the more decisive treatment heard from Stile Antico.